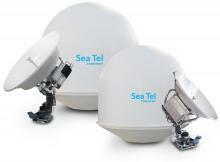 The Sea Tel 4010 & 5010 series antennas are the latest 3-axis marine stabilized VSAT antenna system from Sea Tel designed for installation on board any super yacht, offshore platform or merchant vessel requiring robust and reliable communications. The XX10 antenna series use extremely low loss wave guide and come complete with cross-pol and co-pol feeds, Quad LNBs, ABS (Automatic Beam Switching) and Codan 8 Watt extended frequency BUCs ready for global operation. Whilst the antenna uses many common components from the successful xx09 series the Sea Tel 4010 & 5010 are designed to be lighter and more cost effective than the XX09 antennas especially for vessels operating in less harsh environments where vertical isolation is not required.